Lauren Nicole Gifts for a personalized Mother’s Day Gift this year! You are here: Home / Featured Products of the Week / Lauren Nicole Gifts for a personalized Mother’s Day Gift this year! Are you looking for the perfect Mother’s Day gift this year? Something that is personalized and she will cherish year after year? Lauren Nicole Gifts is the perfect website to check out! I love the Handwriting Jewelry. I received a sample of a bracelet and my son had the opportunity to write a message for me. You can see all the different choices here. 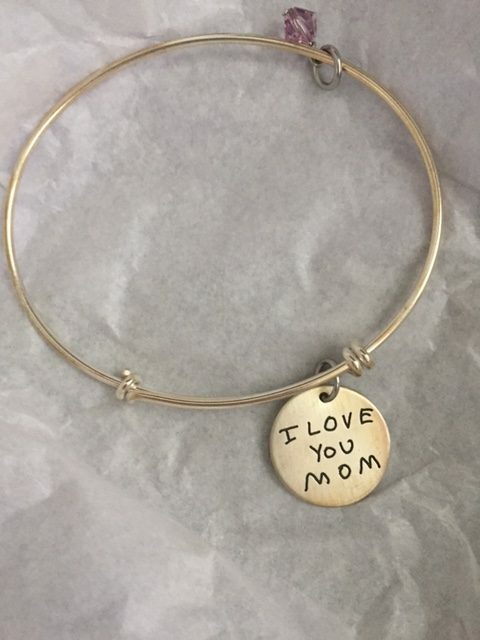 I just love the Handwriting bangle that I received. The handwriting is just as my son wrote it and I like that a birthstone charm is also added. It is available in gold or silver and it is quite stylish! I have been receiving all kinds of compliments on it! You have a max of four words and this will surely make her day this Mother’s Day!